WANG Xiaohe, HAO Li, JI Rong, ZHANG Sen, WU Jifeng, WAN Yang. Relationship between the Type of Parathyroid Hyperplasia and Cognitive Function in Patients with Renal Secondary Hyperparathyroidism[J]. Journal of China Medical University, 2018, 47(11): 993-998. Abstract: Objective To investigate the relationship between the type of parathyroid hyperplasia and cognitive function in patients with renal secondary hyperparathyroidism (SHPT). Methods Forty-three patients with SHPT undergoing parathyroidectomy were enrolled in the study, and the Mini-Mental State Examination (MMSE) and Montreal Cognitive Assessment (MoCA) were implemented to assess the cognitive function of the patients before surgery. 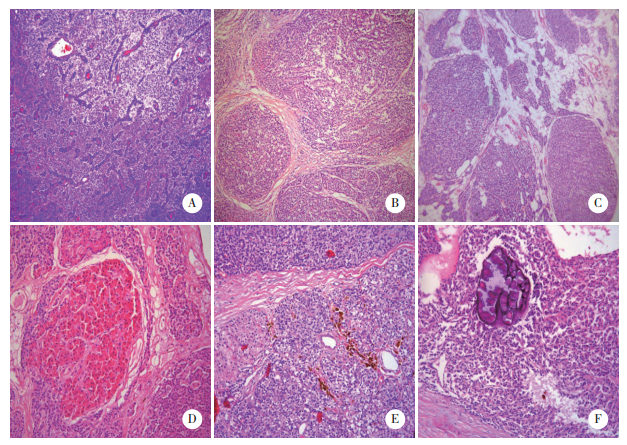 The pathological and morphological characteristics of the parathyroid gland were observed. We compared the differences in the scale scores of patients with diffuse hyperplasia (DH) and nodular hyperplasia (NH), and analyzed the relationship between the type of hyperplasia of the parathyroid gland and changes in cognitive function. Results The numbers of eosinophils and degree of calcification in the NH group were greater than those in the DH group. The MMSE and MoCA scores in the NH group were significantly lower than those in the DH group. The serum intact parathyroid hormone (iPTH) levels negatively correlated with MMSE and MoCA scores, and the serum calcium levels negatively correlated with MMSE scores. The number of years of education positively correlated with the scores of the MMSE and MoCA. Patients with high serum iPTH levels, low numbers of education years, and NH exhibited low cognitive function. Conclusion The eosinophilic changes and formation of calcification are the common secondary pathological changes in patients with SHPT. The cognitive function of patients with NH was generally lower than that of patients with DH, and serum iPTH levels, the number of years of education, and the type of parathyroid hyperplasia are independent risk factors for cognitive changes in patients with SHPT.